After a deep recession, global economic growth has turned positive, driven by wide-ranging, coordinated public intervention that has supported demand and reduced uncertainty and systemic risk in financial markets, according to the IMF's latest report on the global economy. The recovery is expected to be slow, as financial systems remain impaired and support from public policies will gradually have to be withdrawn. Households in economies that suffered asset price busts will continue to rebuild savings while struggling with high unemployment, according to the October World Economic Outlook (WEO), released on October 1. "The recovery has started. Financial markets are healing," said IMF Chief Economist Olivier Blanchard. "In most countries, growth will be positive for the rest of the year, as well as in 2010," he said. But he stressed that, to sustain the recovery, private consumption and investment will have to strengthen as high public spending and large fiscal deficits are unwound. "The current numbers should not fool governments into thinking that the crisis is over," he said at a press conference. He urged countries to coordinate policies to achieve a global rebalancing and sustain the recovery. The report was released ahead of the IMF-World Bank Annual Meetings being held in Istanbul, Turkey. * World growth. After contracting by about one percent in 2009, global activity is forecast to expand by about three percent in 2010 (see table). 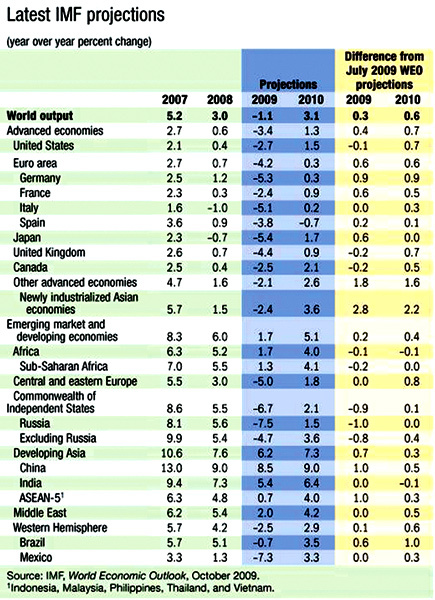 * Advanced economies are projected to expand sluggishly through much of 2010. Average annual growth in 2010 will be only modestly positive at about 11/4, following a contraction of 31/2 percent during 2009. * Emerging and developing economies. Real GDP growth is forecast to reach five percent in 2010, up from 1 3/4 percent in 2009. The rebound is driven by China, India, and a number of other emerging Asian countries. Economies in Africa and the Middle East are also expected to post solid growth of close to four percent, helped by recovering commodity prices. The pace of recovery is slow, and activity remains far below precrisis levels. The pickup is being led by a rebound in manufacturing and a turn in the inventory cycle, and there are some signs of gradually stabilizing retail sales, returning consumer confidence, and firmer housing markets. As prospects have improved, commodity prices have staged a comeback from lows reached earlier this year, and world trade is beginning to pick up. The triggers for this rebound are strong public policies across advanced and many emerging economies that have supported demand and all but eliminated fears of a global depression. These fears contributed to the steepest drop in global activity and trade since World War II. Central banks reacted quickly with exceptionally large interest rate cuts as well as unconventional measures to inject liquidity and sustain credit. Governments launched major fiscal stimulus programs, while supporting banks with guarantees and capital injections. Together, these measures reduced uncertainty and increased confidence, helping to improve financial conditions. This was seen in strong rallies across many markets and a rebound in international capital flows. However, the environment remains very challenging for lower-tier borrowers. More generally, as emphasized in the October 2009 Global Financial Stability Report (GFSR), the risk of a reversal is a significant market concern, and a number of financial stress indicators remain elevated. The key policy requirements remain restoring financial sector health while maintaining supportive macroeconomic policies until the recovery is on a firm footing. The key short-term risk is that the policy forces driving the current rebound will gradually lose strength, and the real and financial forces-although slowly building-will remain weak, as financial sectors have not yet been restored to health. Thus, premature exit from supportive policies must be avoided. On the financial front, a concern-mainly for the major advanced economies-is that continued public skepticism toward perceived bailouts for the very firms considered responsible for the crisis undercuts public support for financial restructuring. This could pave the way for a prolonged period of stagnation, according to the WEO. Sustaining healthy growth over the medium run will depend critically on addressing the supply disruptions generated by the crisis and rebalancing the global pattern of demand. To complement supply-side efforts, there must also be adjustments in the pattern of global demand. Specifically, many economies that have followed export-led growth strategies and have run current account surpluses will need to rely more on domestic demand and imports. This will help offset subdued domestic demand in economies that have typically run current account deficits and have experienced asset price (stock or housing) busts, including the United States, United Kingdom, parts of the euro area, and many emerging European economies. To accommodate demand-side shifts, there will need to be changes on the supply side. This will require actions on many fronts, including measures to repair financial systems, improve corporate governance and financial intermediation, support public investment, and reform social safety nets to lower precautionary saving.